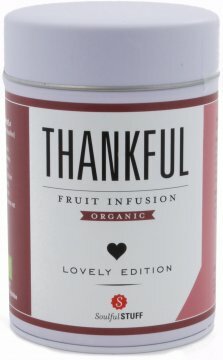 Soulful Stuff Thankful on hedelmä-/yrttihauduke sekoitus, jossa mansikan ja vaniljan maku. In our stressful everyday life we often forget about who cares about us, is there for us and supports us. Therefore, we often take things for granted. Let us remember the important things in life and thank our loved ones. - For their attention, the wonderful time together and for the deep connections with each other. 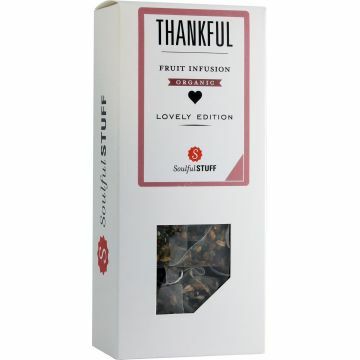 Our delicious organic fruit infusion "Thankful" with strawberry-vanilla flavour warms not only the heart, but also the body. Ainekset: Appelsiinipalaset *, hibiskus *, ruusunmarjaa *, mansikkapalaset * (4 %), punajuuripalat *, vanilja * (2 %), stevialehdet *, kehäkukan terälehdet *.